This Matchless rechargeable unit can only be used with Matchless cartridges which simply screw into the battery. Included in this kit are one battery, a usb charger and 2 full strength (18mg) cartridges. Further replacement cartridges are available in FULL, MEDIUM, ZERO AND MINT versions. Mains chargers, in-car chargers and spare batteries are available as optional extras. The battery comes partially charged so the e-cig works straight out of the pack. The cigarette that satisfies your nicotine cravings and delivers the taste and satisfaction of a traditional cigarette, without the majority of the side effects. This piece of up to date microelectronic "aquamiser" technology looks, feels and tastes like the real thing. It generates a smoke like vapour which is odourless and harmless and contains the latest technology available in the electronic cigarette industry. 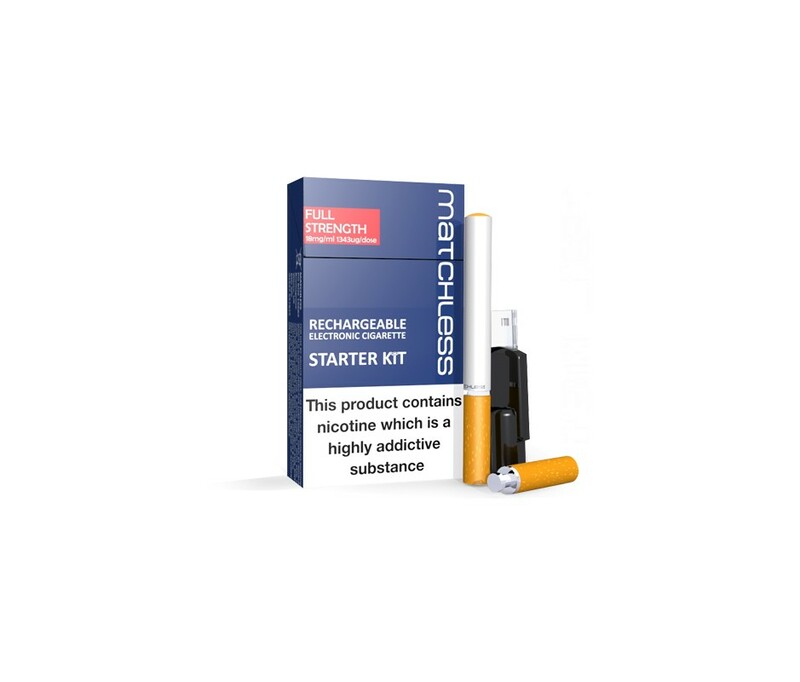 Matchless Electronic Cigarettes, (also called Electric Cigarettes or E Cigarettes) from Matchless represent a new way to “smoke” nicotine in a safer more modern style. Matchless electronic cigarettes are designed for high quality and come in high quality packaging in disposable and rechargeable formats. 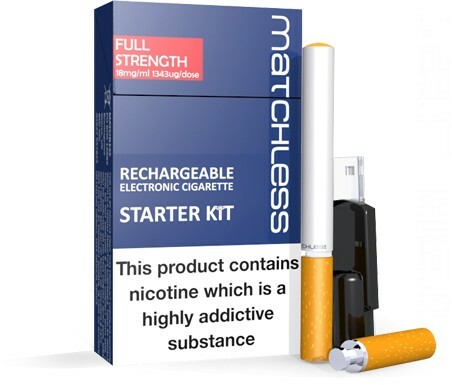 The Full Strength Matchless electronic cigarette comes with Full Strength juice cartridges, a full nicotine strength tobacco flavour e-liquid which is popular choice amongst vapers. A great e-cig and flavour for vapers looking for a very realistic, rich, tobacco flavoured smoky flavour or those looking to take their first step away from smoking. The Matchless electronic cigarette has been designed in the UK, with the UK vaper in mind.